Kilns are thermally insulated chambers, or ovens, in which a controlled temperature regime is produced. They are used to harden, burn, or dry materials. The firing of kilns requires a specific fuel, air or oxygen to "feed" the fire, and a specific time for the firing. Primitive kilns date back to the early days of civilization and are found throughout the world. New kiln technologies began to emerge in China and the Roman Empire in the early years of the Common Era, enabling higher temperatures and new innovations in pottery such as stoneware, ceramics, and the more efficient manufacture of bricks. Modern kilns make use of various technologies from electricity to vacuums and microwaves. Uses of kilns today include firing ceramic materials and bricks, glass processing, creating lime for mortar, drying malted barley or hops for brewing, cement processing, producing charcoal, and drying wood and tobacco. Types of fuel for kilns include wood, oil, natural gas, coal, propane, and electricity. Primitive kiln technology is very old. Fired clay objects date back to the Neolithic period, approximately 10,000 years ago. Archaeologists have found primitive pit-style kilns in nearly every ancient site of consistent human habitation. Fired pottery chards are often used to determine the age of the site and the level of sophistication of primitive cultures. The development of the kiln from a simple earthen pit or trench to sophisticated modern kilns occurred in several stages. One improvement was to build a firing chamber around the pots with baffles to control the air flow and a stoking hole into which pots could be placed and removed while allowing heat to be conserved. One such type of kiln is the "beehive" kiln. A burning chamber with holes for the heat to rise was placed under the brick enclosed chamber where the pottery lay. This type of kiln came into existence only after the arch was created. Another development was the use of a chimney stack that improved the air flow, or draw, of the kiln, thus burning the fuel more completely and at higher temperatures. This allowed temperatures to be controlled by use of a damper that narrowed the opening and restricted the flow of air. Early examples of kilns found in the United Kingdom include those for making roof-tiles during the Roman occupation (45 to 410 C.E.). These "climbing" kilns were built up the side of a slope, such that a fire could be lit at the bottom and the heat would rise up naturally into the kiln for more consistent heat control. The climbing kiln allowed a greater amount of pottery to be fired at the same time than did a single-chambered beehive kiln. Similar to the Chinese climbing kiln is the Anagama kiln. The Anagama kiln has been used since medieval times and is the oldest style of kiln in Japan. This single-chamber kiln was introduced from Korea in the fifth century C.E.. It is favored by potters who prefer natural ash glazes. This kiln usually consists of one long firing chamber, pierced with smaller stacking ports on one side, with a firebox at one end and a flue at the other end. Firing times can vary from one day to several weeks. The interior of the kiln changes as water and organic particles burn off, producing varied results, none ever an exact copy of another. All previous kilns were updraft kilns as the heat traveled naturally up during the firing process. Noborigama (multi-chamber climbing) kilns were invented around the seventeenth century in Japan. This kind of kiln is known as a downdraft kiln as the heat rises up the first chamber, then down into the next one, up again and down into the third and then fourth chambers. The first chamber is fired to the correct temperature and then as the heat travels up and then down, the other chambers are fired in succession until all chambers have been fully burned. This style allows for greater production during one firing and the sharing of heat among the chambers. Ten to 20 times more pottery could be fired at one time than with previous methods. Also, glaze firing became more consistent with this style of kiln. Modern technology has allowed efficient electric, natural gas, or propane fueled kiln usage in all parts of the world. Electric kilns in particular are efficient and do not burn as the elements in the walls of the kiln radiate heat that fully fills the chamber. Thus electric kilns do not have any draft. Many artisans today enjoy using the old technology, such as the Anagama kiln and pit firing when possible. There has been a revival of Anagama kilns in Japan, led by Furutani Michio and Yasuhisa Kouyama. Also, a style of kiln known as Kazegama, was developed by Steve Davis of the USA in 1997 as an alternative to traditional wood firing practices such as those achieved in an Anagama kiln. He carries his kiln on a trailer and takes it to seminars to show its unique firing method that produces ash glazes with gas burning and the introduction of ash during the firing. Kilns either allow the materials to come into contact with the flames, as in lime and cement kilns, to actually burn a substance down, or those in which the fire does not touch the ware, and the heat source is underneath or surrounds the kiln chamber, for brick, glass and pottery kilns, and the drying of organic materials. Currently, in the broadest terms, there are two styles of kilns, both sharing the same basic characteristics of being a static, insulated box with a controlled inner temperature and atmosphere. Intermittent: The ware or pottery is loaded into the kiln, which is then sealed, and the internal temperature increased according to a schedule. There is an increase of heat to a specific temperature, a holding time, and then a decrease of temperature. This is a stationary firing system, nothing moves in or out of the kiln. After the firing process is complete, both the kiln and ware are cooled and then opened and emptied. Continuous: Sometimes called tunnel kilns, these are long structures in which only the central portion is directly heated. From the cool entrance, ware is slowly transported through the kiln on a conveyor, and its temperature is increased steadily as it approaches the central, hottest part of the kiln for a specific period of time. From there, its transportation continues and the temperature is reduced until it exits the kiln on the other side at near room temperature. A specialty type of kiln, common in commercial tableware and tile manufacture, is the Roller-hearth kiln, in which ware, placed on bats (flat, high-fired clay slabs), is carried through the kiln on rollers. 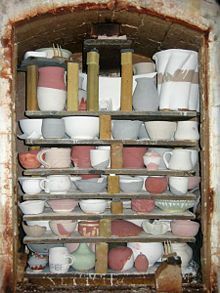 As long as there is still ware to pass through the kiln it can be fired continually, unlike the intermittent kiln which must be stopped and started to fill and empty the pottery. Continuous firing technology was used to produce bricks in parts of the Roman Empire. There are a variety of types of kilns used over time as technology developed. Their style was specific for the type of ware produced. Bottle kiln: A type of intermittent kiln, usually coal-fired, formerly used in the firing of pottery; such a kiln was surrounded by a tall brick hovel or cone, typically bottle shaped with a tall chimney. Top-hat kiln: An intermittent kiln of a type sometimes used in the firing of pottery. The ware is set on a refractory hearth, or slab, over which a box-shaped cover is then lowered. Electric kiln: Kilns operated by electricity were developed in the twentieth century, primarily for smaller scale use in schools, universities, and hobby centers. The heat is transmitted through coils in the kiln and there is neither an updraft nor a downdraft as oxygen is not burned in these relatively clean kilns. As these electrical appliances improved in dependability they became a valuable tool for artists as well. The atmosphere in most designs of electric kilns is rich in oxygen, as there is no open flame to consume oxygen molecules; however Reduction (where oxygen is reduced to produce specific glaze results) can be created with added gas input. Car kiln: An intermittent firing kiln where the bottom of the kiln is not attached to the sides and is set upon a rail-mounted cart. This enables the kiln to be loaded and unloaded outside of the kiln and drawn in to fire the ware. Modern kiln: With the advent of the industrial age, kilns were designed to utilize electricity and more refined fuels, including natural gas and propane. The majority of large, industrial pottery kilns now use natural gas, as it is generally clean, efficient and easy to control. Modern kilns can be fitted with computerized controls, allowing for refined adjustments during the firing cycle. A user may choose to control the rate of temperature climb or ramp, hold or soak the temperature at any given point, and control the rate of cooling. Both electric and gas kilns are common for smaller scale production in industry and craft, handmade and sculptural work. Kilns are an essential part of the manufacture of ceramics, which require firing at high temperatures. During this process, chemical and physical reactions occur which cause the clay material to be permanently altered. For pottery, clay materials are shaped, dried, and then fired in a kiln. The final look and condition is determined by the chemical composition of the clay body, the preparation process, the temperature and length of the "hold" time at which it is fired, and the glazes that may be used. Clay consists of fine-grained particles that are relatively weak and porous. Part of the firing process includes sintering where the clay becomes a coherent mass. The firing process heats the clay until the particles partially melt and flow together, creating a strong, single mass composed of pores and crystalline material. Through firing, the pores are reduced in size as water and organic materials burn off, causing the clay to shrink and become more dense, resulting in a hard, and strong yet brittle piece. The higher the kiln temperature the denser the piece becomes. Earthenware is fired at 1800°F to 2100°F. It is lighter and easier to break and porous, thus needing to be glazed in order to seal it against moisture. The glaze is fused to the surface of the clay, which—when hit—allows chipped edges. It is not frost proof. However, it is relatively cheap to produce and the glaze colors are often brighter and more exciting than the higher-fired ware. Stoneware is much denser and heavier than earthenware, and the glaze joins with the clay on a cellular level. When a piece of stoneware is hit, the glaze does not break off but a piece of the pot with the glaze connected can break off. Fired at 2000°F to 2300°F, stoneware is impervious to liquids and freezing. It takes a longer time and more fuel to fire, increasing the cost. It is often referred to as "man-made rock." Kilns, preferably electric, are also used to heat glass to the point that it can be molded into specific shapes, to fuse glass onto another material, or to melt it for artistic use—a process called annealing. Cloisonné is enameled metal containing fine gold or silver wires creating shapes, into which powdered colored glass called frit is poured. Spaces for the frit are made by the wire glued to the surface of the metal and then fired in a kiln where the frit fills in the areas as it melts. Other uses for decorative glass, such as stained glass windows, jewelry, and pottery decoration, can involve melting glass in a small kiln. Brick kilns replaced sun drying bricks in many parts of the Far East, and later Europe. Most likely pit-firing was the kiln style used, stacking the green bricks (unfired) in a lattice configuration to allow the flow of hot air, and covering it as the fuel burned away. The earliest fired bricks were found in East Anatolia, Turkey dating from 7500 B.C.E. Other early finds date from 7000 and 6395 at Jericho and Catal Huyuk. From archaeological evidence, the inven­tion of the fired brick (as opposed to the consid­erably earlier sun-dried mud brick) is believed to have arisen in about the third millennium B.C.E. in the Middle East. Being much more resistant to cold and moist weather conditions, brick enabled the construction of permanent buildings in regions where the harsher climate precluded the use of mud bricks. Other finds date from 3000-1600 B.C.E. The Romans used a mobile brick kiln in many remote areas of Europe. A lime kiln is used to convert limestone to lime for mortar and other uses, at temperatures reaching 1650°F-1830°F. Nearly all early civilizations used lime as a stabilizer in mud plaster and floors. Knowledge of its value in agriculture is also ancient, but agricultural use only became widely possible in the late thirteenth century after the advent of coal as a cheap fuel. Cement goes back to ancient Greece and Rome. It was made from lime and volcanic ash that slowly reacted with it in the presence of water to form a hard mass. This formed the material of the Roman mortars and concretes used all over Western Europe. Remnants have been found in the buildings of the Roman Empire from 2,000 years ago, in the aqueducts that stretch across vast areas, as well as in the brick roads that transported trade and soldiers. Portland cement clinker  is manufactured by burning and grinding a mixture of limestone and clay or limestone and shale, and was first made in 1842 in a modified form of the traditional static lime kiln. To the egg-cup shaped lime kiln was added a conical or bee-hive chimney which increased the flow of air raising the heat to the necessary temperature. However, its size limited the amount of clinker produced per batch, only 30 tons a week. In about 1885, a continuous firing kiln was made, allowing for continuous production of cement clinker. This shaft kiln, like a blast furnace, was built on a slant. It allowed the raw mix in the form of lumps and fuel to be continuously added at the top, then sintered and dropped out of a hole in the bottom. It was replaced by the rotary kiln which turned as it burned for more efficient production. Today, rotary kilns account for more than 95 percent of world's production of cement clinker. In China the shaft kiln was revived after 1970 and is used primarily in rural areas away from major routes. Several thousand such kilns were constructed in China. A typical shaft kiln produces 100-200 tons per day. allowing the heat to escape through a cowl in the roof which turned with the wind. Tobacco was gathered by hand after it dried, packaged and sent for cigar, cigarette and chewing tobacco production. The freshly picked hops from the fields were raked into the structures to dry and then raked out to cool before being bagged up and sent to the brewery. England used oast houses—usually a round house with several floors—to dry hops for brewing in the sixteenth to twentieth centuries when square houses replaced the round ones. 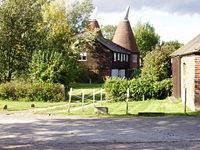 The remaining oast houses today have been turned into residential use as large commercial drying facilities have replaced the old style of buildings. Production of wood charcoal in districts where there was an abundance of wood, dates back to early times in Europe and generally consisted of piling billets of wood on their ends so as to form a conical pile, openings being left at the bottom to admit air, with a central shaft to serve as a flue. The whole pile was covered with turf or moistened clay. The firing was begun at the bottom of the flue and gradually spread outwards and upwards. The success of the operation depended upon the rate of the combustion. The operation was so delicate that it was generally left to professional charcoal burners. 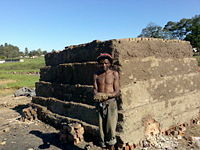 Charcoal is also fired in brick or stone kilns. Modern charcoal kilns, or retorts, are still simple in style but use a closed chamber of iron, steel or brick to make charcoal, retaining valuable by-products of the process. Wood drying kilns shorten the time it takes for wood to be usable as firewood or as building material. A variety of wood drying kiln technologies exist today. The types are conventional, dehumidification, solar, vacuum and radio frequency. Conventional wood drying kilns are either a side-loaded intermittent kiln filled by forklift, or a tram system like a tunnel kiln. Heat is typically introduced via steam running through fin/tube heat exchangers controlled by on/off pneumatic valves. Cool dry air is usually introduced at one end of the kiln while warm moist air is expelled at the other, and the introduction of humidity via either steam spray or cold water misting systems to keep the relative humidity inside the kiln from dropping too low. Fan directions are typically reversed periodically to ensure even drying of larger kiln charges. Most softwood lumber kilns operate below 240°F. Hardwood lumber kiln drying schedules typically keep the dry bulb temperature below 180°F. Easy to dry species might not exceed 140°F. Dehumidification wood drying kilns are very similar to conventional ones in basic construction and drying times. Heat is primarily supplied by an integral dehumidification unit which removes the humidity which dries out the wood in the kiln. Solar kiln's are conventional wood drying kilns, typically built by hobbyists to keep initial investment costs low. Heat is provided via solar radiation, while internal air circulation is typically passive or non-electric. Vacuum wood drying kilns include the use of reduced atmospheric pressure to attempt to speed up the drying process, like a pressure cooker. These kilns are significantly more popular in Europe where the locally harvested wood is easier to dry versus species found in North America. RF/V (radio frequency + vacuum) wood drying kilns use microwave radiation to heat the kiln, and typically have the highest operating cost due to the heat being provided by electricity rather than local fossil fuel or waste wood sources. ↑ Kiln History. ART 186 - Intro To Ceramics Kilns - History and Basic Designs. seco.glendale.edu. Retrieved September 5, 2007. ↑ History of Kilns. seco.glendale.edu. Retrieved September 7, 2007. ↑ "Wind kiln". 'www.kazegamas.com. Retrieved August 23, 2007. 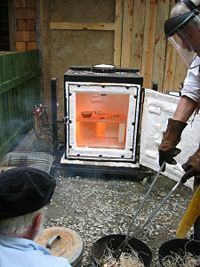 ↑ The exception to this is Western Raku firing which uses the intermittent-type box kiln but the ware is taken out while still red hot and placed in a burning receptacle in order for the carbon to dye the piece. ↑ Primarily silicon and aluminum oxides. ↑ Clinker is the solid material produced by the cement kiln stage that has sintered into lumps or nodules, typically of diameter 3-25 mm. ↑ Cement kiln. en.wikipedia.org. Retrieved September 5, 2007. Hamer, Frank and Janet. The Potter's Dictionary of Materials and Techniques. Univ. of Pennsylvania Press; 3rd edition, 1993. ISBN 0-8122-3112-0. This page was last modified on 16 June 2014, at 15:19.